Well, here’s something new. 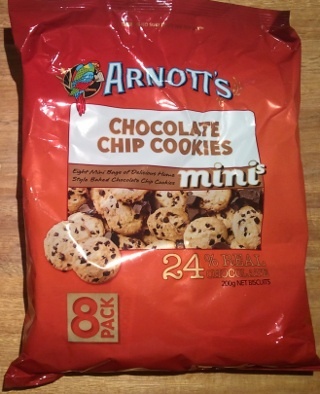 Arnott’s have created mini version of their Farmbake Chocolate Chip Cookies, and then put them in a bag, and then put the bag in a bag. Clearly designed for snacking, you can grab a small packet of bite-sized cookies from the bag to take with you as you choose your own adventure. There are eight packets of cookies in the bag, and there are only six cookies in each pack. This means it is necessary to have at least three small packets to get a decent serving, so your big bag may not last as long as you thought. 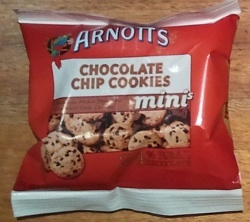 The cookies themselves are indeed very mini – perhaps even verging on ‘micro’. They are not much bigger than an Australian twenty cent coin, as as such are eminently chompable. Indeed, with so few in each small packet, it’s easy to finish the packet before you’ve even realised you’ve started it. They are quite tasty biscuits nonetheless, and as expected they taste exactly like chocolate chip cookies. It’s a strange thing; whilst most biscuits vary somewhat by manufacturer there just seems to be a universal recipe for chocolate chip cookies that is followed internationally be every biscuit manufacturer, as they all taste exactly the same. They all have that light dusting of crumbs on them; they all are quite crunchy with a kind of brown sugar taste, and they all seem to have about the same amount of chocolate – notwithstanding that fact that Arnott’s are keen to proclaim that their version contains ‘24% real chocolate’. Why twenty four, I wonder. Why not just tip in one more choc chip to get it to a round 25%? I’d give these a seven ou t of ten, with a bonus point for being interesting, but minus a bonus point for the portion size being so small.